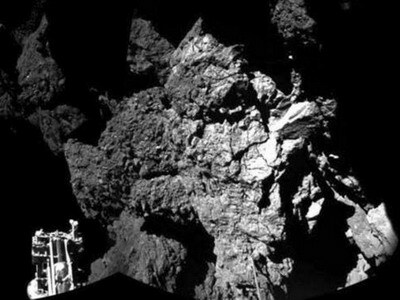 A European probe that landed on a comet in a first for space exploration is resting on the surface despite technical problems, pictures beamed half a billion kilometers (300 million miles) back to Earth showed on Thursday. The lander, named Philae, was launched from its mothership Rosetta on Wednesday as it orbited comet 67P/Churyumov-Gerasimenko, the climax of a 10-year-odyssey for the European Space Agency (ESA). But during Philae’s seven-hour descent to the comet, harpoons designed to anchor it failed to deploy, raising concerns the lander might drift back into space. The ESA published an image on Thursday of the 100-kg (220-pound) lander – virtually weightless in its current environment – on the comet’s bleak, rocky surface. It said data showed the lander had twice bounced back into space after touching down on Wednesday, but then come to rest at around 1230 ET. Scientists hope that samples drilled out from the comet by Philae will unlock details about how the planets – and possibly even life – evolved, as the rock and ice that make up comets preserve ancient organic molecules like a time capsule. Comets date back to the formation of the solar system some 4.6 billion years ago. Scientists suspect impacting comets delivered water to early Earth.